Defenders of Nation of Islam Minister respond to false charges against him, attacks by Jewish and Zionist groups and expose the enemies of the rise of Black people. Jewish and Zionist groups who have harassed, slandered, and stalked Nation of Islam Minister Louis Farrakhan began spinning another web of deceit and lies after the Muslim leader delivered a powerful three-hour message to close the Nation’s annual Saviours’ Day convention in Chicago. It started weeks earlier, but like a wave built to a crescendo. The problem is the wave didn’t wash away its target. Jewish efforts to force Black leaders and activists to publicly disavow the Minister were largely unsuccessful. And, the Jewish onslaught was met with a stinging rebuke by those who love the Minister, those who recognize his value to the Black community, and those who refuse to accept the 30-year-old lie that he is anti-Jewish. Min. 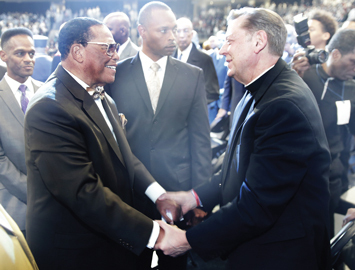 Farrakhan greets his longtime friend and ally Father Michael Pfleger of St. Sabina. Munir Muhammad drew a diverse crowd of elected officials, judges and potential judges, professionals and corporate leaders to the March 4 annual fundraiser for the Coalition for the Remembrance of the Honorable Elijah Muhammad in Chicago (CROE). CROE preserves and presents the words and work of Elijah Muhammad through photos, videotapes, lectures, and broadcasts and special programs. It is a Nation of Islam archives. After a couple of starts and pauses, he brought in Min. Farrakhan who offered brief words about Munir Muhammad and CROE’s work, which includes distribution of interviews and shows through a wide cable TV network and the Internet. Munir Muhammad was unapologetic in his embrace of the Minister and warned his audience about giving into fears and lies about Min. Farrakhan, a man who has worked for Black people. Eleven-thousand people came to hear the Minister at the Wintrust Arena and he has been serving us for 62 years, said Munir Muhammad. Yet, he said, Whites can come and question you about taking a photo with him? I love to take pictures with him and so do you, I saw you with your phones out, said Munir Muhammad. But, he added, these attacks and lies on the Minister should not be allowed. Min. Farrakhan is not a hater, he said. During his Feb. 25 message, Minister Farrakhan responded to charges of anti-Semitism that reemerged with the publication of a 2005 photo of the Minister and then-Senator Barack Obama of Illinois. After howling unsuccessfully for President Obama to repudiate Min. Farrakhan again, the ADL, other paternalistic Zionist organizations and Jewish publications demanded to know why the Minister was invited to the Congressional Black Caucus legislative weekend, where the photo was taken. They polled Black lawmakers and again demanded that “Farrakhan be repudiated.” The vast majority of Black congressmen did not bow to their demands. 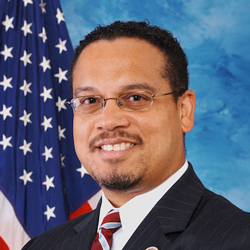 Next came shots aimed at Rep. Keith Ellison of Minnesota, who is Black and a Muslim. Jewish people have control of agencies of government and the enemy is so angry that if you like me and want something in this world, you have to denounce me or keep the relationship secret, said Min. Farrakhan. Minister Farrakhan again called out his Jewish detractors to a public debate and challenged them to defeat the truth that he has consistently spoken from the Honorable Elijah Muhammad that Blacks in America fulfil prophecy and are the true children of Israel. 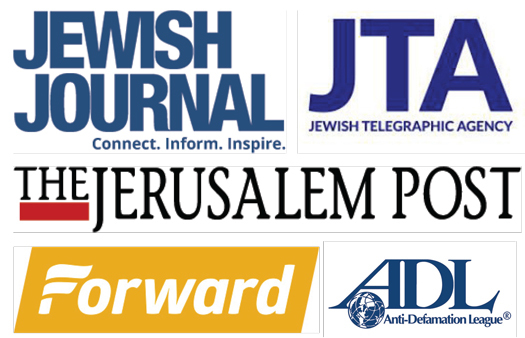 Instead, the Anti-Defamation League took to social media to attack the Minister and Jewish and right wing media outlets joined the assault. Yet the 10,000 seat arena where the Minister spoke in Chicago was full, his Instagram account shows him dispensing wisdom to another generation of young people and his recently released boxed set music compilation features such artists as Snoop, Rick Ross, Common, Chaka Khan and others. Surely these individuals would not associate with a hater. “This is why you see this resurgence of attack, because for all that the Anti-Defamation League, the Southern Poverty Law Center, the media controlled by the Jews have done has not stopped the truth coming from the Honorable Minister Louis Farrakhan. And they have not been able to separate the divine, magnetic power that the Honorable Minister Louis Farrakhan has from the God and his Christ and their people, which is Black people and oppressed people throughout the world,” said Abdul Arif Muhammad, Nation of Islam general counsel. Recording artist Stephanie Mills and Min. Farrakhan at Saviours’ Day. R&B singer and actress Stephanie Mills exemplified this sentiment when she bowed at his feet and kissed his hands after serenading Minister Farrakhan with a rendition of “To God Be The Glory,” before his Saviours’ Day keynote. Ms. Mills said she has no fear, never has, and bowed to show the world her devotion to Minister Farrakhan and the valuable man that he is. Minister Farrakhan’s helpers, followers, and supporters noted he and the NOI have withstood his enemies’ unfounded attacks for decades with the protection of Allah (God) and his enemies know he is backed by God. “The so-called Jews, this is what they do. This is what they’ve been doing,” said Anthony Shahid, St. Louis activist and co-founder of the Tauheed Youth Group. He also started the “Hands Up Don’t Shoot” chant that emerged following the killing of Mike Brown by a police officer in Ferguson, Mo., in 2014. “First of all, I’m thankful to Allah that we have a man like him, who stands on truth. … He’s the last figure that’s standing that they can’t make him bend. And they can’t break him. And they can’t buy him,” Mr. Shahid told The Final Call. “This is the only thing that they can do, but they’ve got to remember that this is not him doing this. This is what Allah’s doing. Allah chose him,” said the activist, who has known Minister Farrakhan since 1965. “They’re not attacking Minister Farrakhan. They’re attacking us as a people. … He’s our spokesman. He stands up and speaks for us,” Mr. Shahid said. Dr. Ava Muhammad, Minister Farrakhan’s national spokesperson, a NOI student minister, and attorney, saw another aspect of the Jewish attacks and the Minister’s continued success. 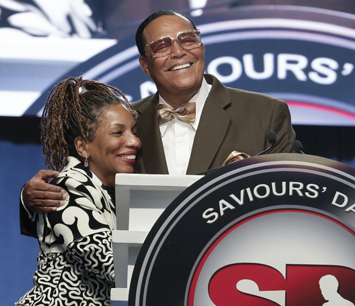 “It is because they are losing the war between truth and falsehood, because our people, with the help of Allah and the help of Satan, are accepting the truth that Minister Farrakhan has been preaching for 62 years and the last 40 years alone, in the absence of his teacher,” said Dr. Ava Muhammad, who also hosts a radio show on WVON-AM 1690 in Chicago. She said the attacks and upset over the photo with Barack Obama, Black politicians and Tamika Mallory’s audience participation at Saviours’ Day are signs that his enemies recognize Minister Farrakhan’s influence. Philadelphia’s Jihad Ahmed, community activist and founder of the Men of Purpose Initiative said, the ADL’s attacks fall on death ears in the Black community. “Most Black people support Min. Farrakhan because they see him as the last of the great leaders. Min. Farrakhan has been out on the front line for our community for well over 60 years,” he told The Final Call. Minister Farrakhan’s enemies are circulating photos of him with Black politicians, one including the names of 21 Black civic leaders, purportedly Black members of Congress, who have not disavowed him. “Zionists attack him because his message contradicts their interests. Zionists turned on Rev. Jackson when he met with (Palestinian Liberation Organization) Chairman (Yasser) Arafat. We have more in common with the oppressed Palestinians than we do with their Zionist oppressors,” said Dr. Leon. “It was the government of Israel that backed the apartheid regime in South Africa. We have more in common with the Black South Africans than we do with Zionists. Minister Farrakhan has been a clear voice in the anti-Zionist movement,” he continued. “Historically, the Minister’s ‘do for self’ message of economic, religious and cultural nationalism grew out of the Black Power struggle between 1967-1970. I realize that the Nation was formed before this but there was a real rise to power during this time. This was the time that the rise of the Honorable Elijah Muhammad and the Nation grew parallel with the Black Power Movement and a strong sense of Black Nationalism,” said Dr. Leon explained. “There is an attempt to stir the masses of people away from the Minister because he and the teachings of the Most Honorable Elijah Muhammad represents a whole new world that does not include oppression, falsehood, and destruction. Minister Farrakhan is the last man standing, who represents the most downtrodden and oppressed people on earth,” said the young activist and political leader. “The ADL used our hashtags in order to ride in on what they know is always trending during Saviours’ Day weekend,” said Jesse Muhammad, social media strategist for Minister Farrakhan and the Nation of Islam. “People were attacking us while the Minister was speaking because why? Farrakhan was trending in the national rankings. He was trending number one at one point and he stayed in the number five spot for over two hours. So they were cursing us out and cursing at him. They even hate to see the Minister’s name even trending on their laptops and their smartphones,” he said.